U.S. OshKosh B'gosh is offering an amazing Spend More, Save More event. Take 10% off your purchase of $20 or more. Take 15% off your purchase of $30 or more. Take 30% off your purchase of $60 or more. 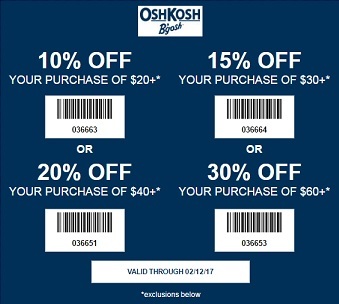 Offer is valid at U.S. OshKosh B'gosh stores and U.S. OshKosh B'gosh online. Source of the information is U.S. OshKosh B'gosh. Offer is valid until Sunday, February 12, 2017. For more details about the offer visit any U.S. OshKosh B'gosh store and U.S. OshKosh B'gosh online.